A new springtime has begun in South Jersey, and during the closing Mass of the historic Convocation of Catholic Leaders: The Joy of the Gospel in South Jersey at Harrah’s Waterfront Conference Center in Atlantic City last week, the Bishop of Camden evoked the national pastime, baseball, that is back in swing. Bishop Dennis Sullivan celebrates Mass in Harrah’s Waterfront Conference Center, Atlantic City on March 26, the first full day of the Convocation of Catholic Leaders: The Joy of the Gospel in South Jersey. The four-day event was planned as both a celebration of the faith and a call to missionary discipleship that will have practical results in parish life. In attendance were teams from every parish in the Diocese of Camden. 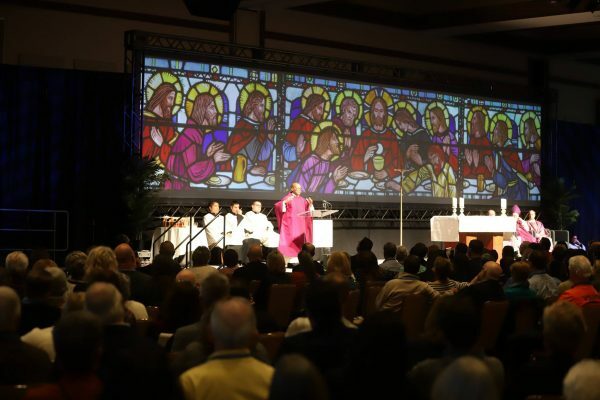 “Today is opening day for your church,” Bishop Dennis Sullivan proclaimed to the approximately 800 clergy, religious and lay leaders in attendance for the four-day gathering. “We have spent the last four days listening to many voices who have come here to speak to us and listening to one another in our breakout sessions and at our parish tables,” he continued. Four years later, in July 2017, a national convocation inspired by this document took place in Orlando, Florida, organized by the United State Conference of Catholic Bishops, with speakers and workshops creating a fertile soil for missionary discipleship throughout the United States. Bishop Sullivan and 23 other delegates from South Jersey who traveled to Florida, enthusiastically brought back seeds for cultivation in the Diocese of Camden, and quickly readied the ground for the March 25-28 program, which hosted parish teams from each of its 63 parishes. Passionate national speakers, inspiring local witness talks, and rousing praise and worship combined with parish fellowship and empowering workshops for one combustible atmosphere, burning brightly with the joy and peace that come from a transformative encounter God’s love. The diversity of the Catholic Church of South Jersey was on full display in Atlantic City, with the young and the seasoned sharing thoughts in the hallways, and Caucasian, African-American, Hispanic, Filipino and other delegates breaking bread together at meals and during the liturgy. “This conference has opened up my eyes, in faith, to do more,” said 25-year-old Van Roa, a delegate from Saint Katharine Drexel in Egg Harbor Township, on Thursday afternoon, a few hours after the final plenary presentation by Christopher Lowney, a writer, public speaker and leadership consultant whose book, “Everybody Leads,” was required reading for all delegates in advance of the convocation. “People need to see the work of the Lord in us,” Lowney said, stressing the importance of “intentional leadership.” As well, he urged participants to not be afraid to step out of their comfort zones, past their familiar places and faces, to evangelize. “Get your shoes dirty for Jesus,” Lowney exclaimed. Gary Wiley, from Saint Peter Parish in Merchantville, sees his parish doing just that. “The hard work is just starting,” but he and his church community are ready to dig in and cultivate the soil, he said. AnnaMarie Mahieu, from Our Lady of Perpetual Help in Galloway Township, found strength amidst difficult times. Her grief almost prevented her from coming to Atlantic City, but it was her surviving son and daughter who told her to go, knowing that the longtime volunteer and past director of adult catechesis would find healing. Both the diversity and unity of the church were evident during the four days. “Coming to the United States from the Dominican Republic, I would sing church songs here in English,” remembers Marianela Nuñez, part of the Convocation Steering Committee, and director of Latino Enrollment for the diocesan Office of Catholic Schools. “At Harrah’s, I saw English-speaking Catholics now singing Spanish songs during Mass,” she happily declared. At the conference’s end, hearts and souls were not weary from long days and nights of fellowship and community, but energized and eager to continue the joy-filled momentum. Delegate Bob Dooley said this past weekend “two of us spoke at each Mass” about their convocation experience at his parish, Our Lady of the Angels in Cape May Court House. “This is not a winding down, but a winding up,” believes Father Chris Mann, pastor of Atco’s Christ the Redeemer Parish. Echoing the sentiments of the Convocation’s first speaker, Julianne Stanz, Saint Andrew the Apostle, Gibbsboro’s Suzette Parangao says her delegation was ready to return home and “tell our stories” of encounter with the Lord, and the grace and joy such an experience can bring. Other plenary speakers were Dr. Hosffman Ospino, associate professor of theology and religious education, Boston College, School of Theology and Ministry; Cardinal Joseph Tobin of Newark; and Dr. Carolyn Woo, Distinguished President’s Fellow for Global Development, Purdue University. The journey of cultivating the faithful on fire with the love of the Lord continues in South Jersey. Donna Ottaviano-Britt, Director of Missionary Discipleship for the diocese, will meet in the coming weeks and months with each parish to discuss strategies on implementing a sustained culture of encounter and discipleship in their communities.